Mid-Life Cruising!!! : Our Life In A Month! Our Life In A Month! 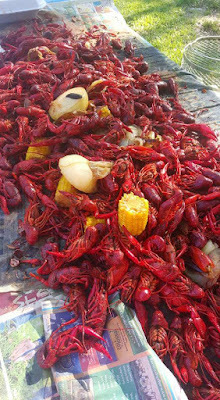 Celebrating Mother's Day with crawfish ... known as "mudbugs" around here! It seems that I've let another month pass by since my last post. Time flies when we're having fun ... and even faster when we're working a lot! The last week of April was busy finishing up last-minute repairs for our new tenants. Yes, after two months we finally found new tenants for one of our two vacant rentals! The young couple had met all of our criteria and moved in the 1st of May. We're hoping that they're as good as they seem .. and stay a long time! Just as we were down to one vacant rental that we're currently getting ready (and just started advertising yesterday) ... another tenant moved out on May 12th. We only have four rentals, but I swear it seems like 40! Luckily, he gave us proper notice and left the place in good shape. 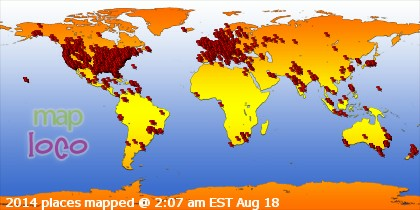 We started advertising right away and have shown the place a few times, but again .. we're being cautious. One rental down, two to go! Hope I don't jinx us ... that 4th rental has a lease that expires the end of July. Hopefully we're laying the ground work for good tenants while we're cruising. The following weekend was Mother's Day, and a crawfish boil ... thank you my daughter & son-in-law! A day at the kid's house with gorgeous weather, my own mother, our daughter, her new family, and crawfish boiled by our son-in-law ... I needed this relaxing day! Ken had recently shared his "secret" recipe with our son-in-law and it was time to see how much he had learned. Ken's recipe has earned him first place at an annual "Crawfish Cook-Off" that he's participated in for several years, and now the recipe will live on. Our son-in-law nailed it ... the crawfish were great! Last weekend we finally got to start another project on Nirvana ... painting the cream-colored non-skid on the top deck and on the cockpit floor. We started on Friday the 13th (pretty good day for us) and we were pulling off the tape on Sunday afternoon. I'll have all the details in a future post once we actually finish this project, but we're really happy with the results. This was much easier than our earlier project of spraying the glossy areas of the deck (which didn't turn out so glossy)! The weather's looking good again this weekend, so we plan on applying white non-skid on the cockpit's seating area. Hopefully we'll also get to the last part of this project ... cream non-skid on the sides of the deck. Then, it's time to start installing all of that deck hardware that we removed so long ago. 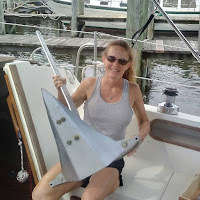 There was a ton of hardware on this boat ... hope we can remember where it all goes! 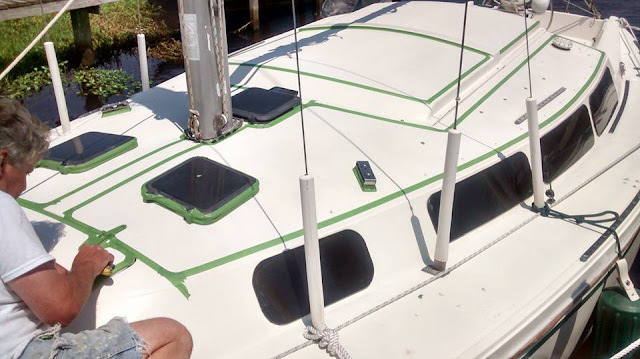 New stanchion backing plates are on their way, and Saturday morning we're making a quick trip to New Orleans to pick up some new wood for the sides of our companionway hatch ... teak rots! Have you ever heard of Epay?! Check it out ... we're gonna give it a try. 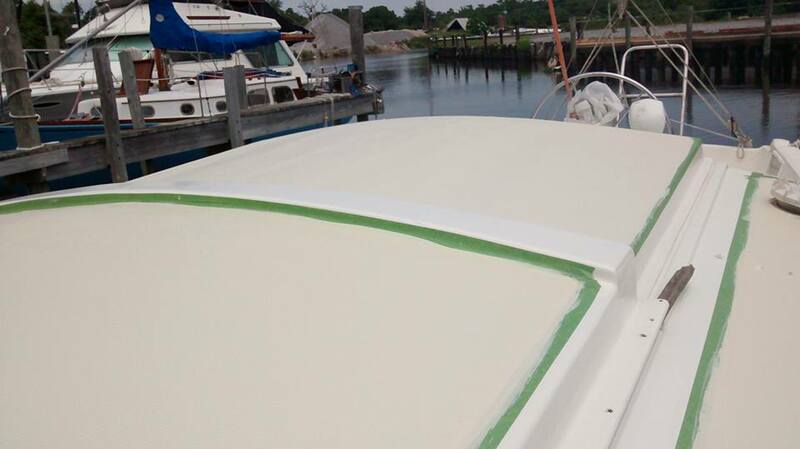 We also have an Outland Hatch Cover on the way ... we won one thanks to them and a contest given by The Boat Galley! 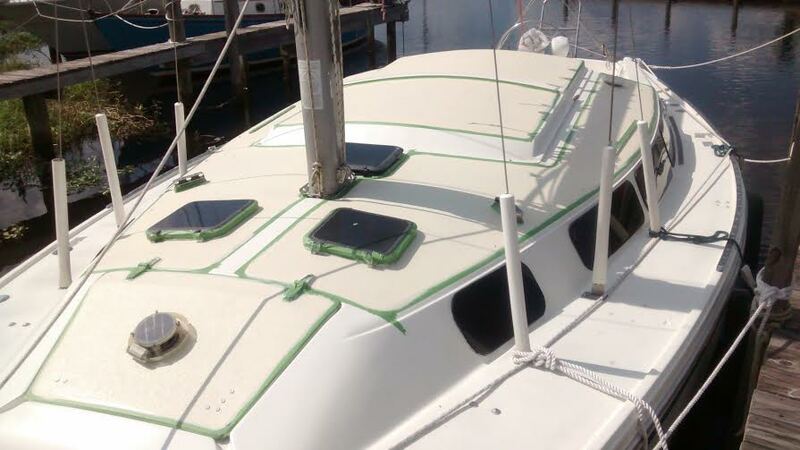 We're looking forward to trying the cover on the hatch near our mast. It should keep the salon a lot cooler ... I see two more hatches in our future! We gave our hatches a face-lift a while back, and they already could use some protection. Thanks guys! I almost forgot something else we're excited about ... we signed up for a 10 week (2 hrs per week) navigation course! The class starts the end of this month, and it's given by the Lake Pontchartrain Sail & Power Squadron. This isn't an online class ... we'll actually be in a classroom! We're really looking forward to learning how to read a paper chart and plot a course. We'll also learn how to use our chart plotter ... we really need this course. This will be big progress for us. We've got places to sail and no knowledge on how to get there ... yet! Smart on the navigation course. So many people go out and don't have a clue about their vessel or what to do in emergencies. Bless their hearts. I've got my fingers crossed that you'll get great tenants and you'll be able to cruise without worrying.